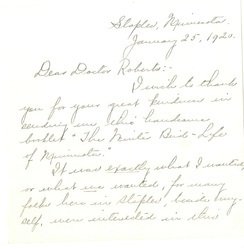 In February of 1916, Thomas Sadler Roberts, associate curator of the Zoological Museum, released the first of what he termed “Occasional Papers,” a series of bulletins issued from the “Zoological Division of the Geological and Natural History Survey.” The content of volume number one, titled “The Winter Bird-Life of Minnesota,” was actually first published in the December 1915 edition of “Fins, feathers and fur,” a publication of the Minnesota Game and Fish Commission (now known as the Department of Natural Resources). Roberts’s paper provides an illustrated annotated list of the “permanent resident” and “winter visitant” birds found in Minnesota. 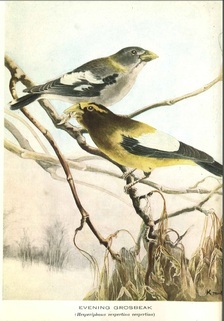 The paper opens with a beautiful full-color illustration by artist Kako Morita that shows the distinct yellow coloring of the Evening Grosbeak. The bulletin also became a much sought-after reference tool to the growing base of Minnesota citizens interested in bird study. 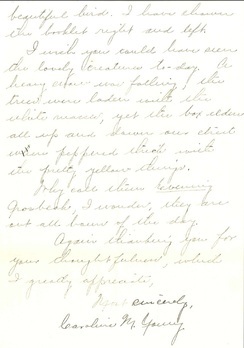 Dozens of letters were written to Roberts to request materials and literature on birds. Without charging any fee for the publication itself or the postage to send it, Roberts forwarded copies of “Winter Bird-Life” to any person that requested it (that is up until the mid-1920s when the supply was exhausted). I wish to thank you for your great kindness in sending me this handsome booklet “The Winter Bird-Life of Minnesota”. It was exactly what I wanted, or what we wanted, for many folks here in Staples, beside myself, were interested in this beautiful bird. I have shown the booklet right and left. I wish you could have seen the lovely creature today. A heavy snow was falling, the trees were laden with the white masses, yet the box elders all up and down our street were peppered thick with the pretty yellow things. Why call them Evening Grosbeaks, I wonder, they are out all hours of the day.